Designed by Studio VI+M, Normanna is a tribute to Sicily, the designer’s homeland, and the richness and fullness of the colors that characterize its art and architecture. Composed of a delicate sphere that makes a diffuser for light and expresses the high chromatic potential of Murano glass – ruby pink, amethyst pink, amber yellow, apple green, emerald green, Mediterranean blue and London grey – Normanna rests on a brushed brass base embellished with triple fringe with a vaguely retro flavor. PURHO — Italian soul with an international character Founded in 2012 by CEO Andrea Dotto aiming to turn into reality the potential of the marriage between Murano glass and contemporary design, Purho is now capable of marketing products stemming from solid research based on the observation of current tastes and new creative languages seen through the lens of the Murano glassmaking tradition. The result is a range of thematic collection of sleek products characterised by a clear-cut design with only a few decorations: what stands out is their curvy as well as markedly geometrical lines featuring colour in its purity as a main trait. Indeed, there are twenty-one special nuances that make up a dense energetic palette available for personalization and bespoke products. 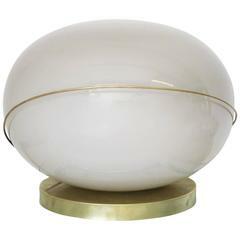 Italian Murano glass and brass table lamp. Measures: Diameter 36 cm. Height 56 cm. One E27 bulb. 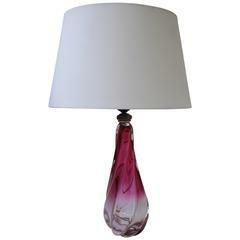 Murano glass table lamp. Lamp shade are not included in the price. Measures: Height with socket 35 cm. Width 11 cm. 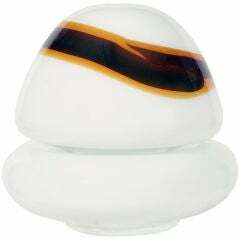 Italian Murano table lamp. Height without shade is 37 cm. Diameter is 12 cm. Height with the shade is 54 cm. Diameter is 34 cm. Price without shade. Table or floor lamp "Clan" by Studio 6G 1968 for Guzzini, Italy Large version. 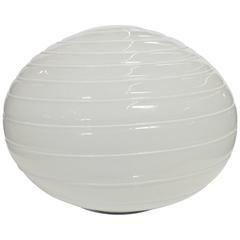 Italian Murano glass with white stripe swirl table lamp or floor lamp. Single light socket/wired for U.S.